At the start of the game, I had sent Britain’s shipyards into overdrive producing warships and merchantmen, and that pays off. With the defeat of the French fleet at the end of the first turn, this leaves the Royal Navy – and accompanying British ground forces – free to go on the global offensive, ready to make the world safe for tea, cricket and British trade. 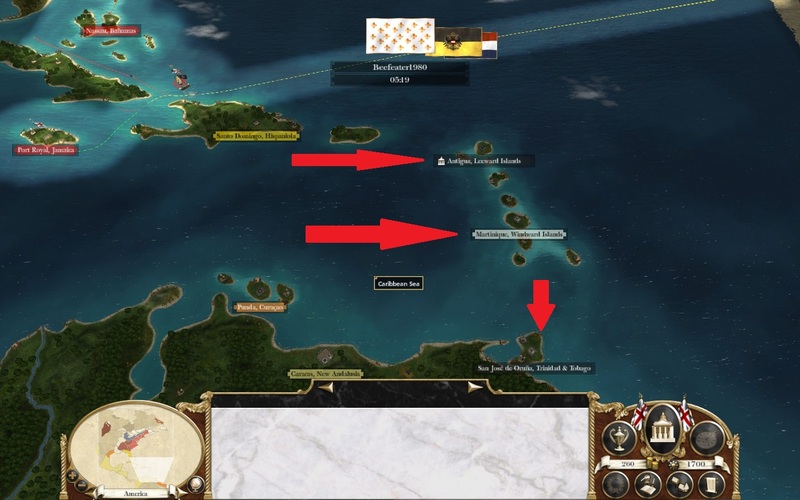 Britannia’s might lands most heavily in the Caribbean. The pirates, in their lairs at Antigua in the Leeward Islands and San Jose de Oruna in Trinidad & Tobago, learn that His Majesty’s soldiers do not know the meaning of the word “parley”. The undefended Spanish – formerly French – colony of Martinique surrenders without a shot. 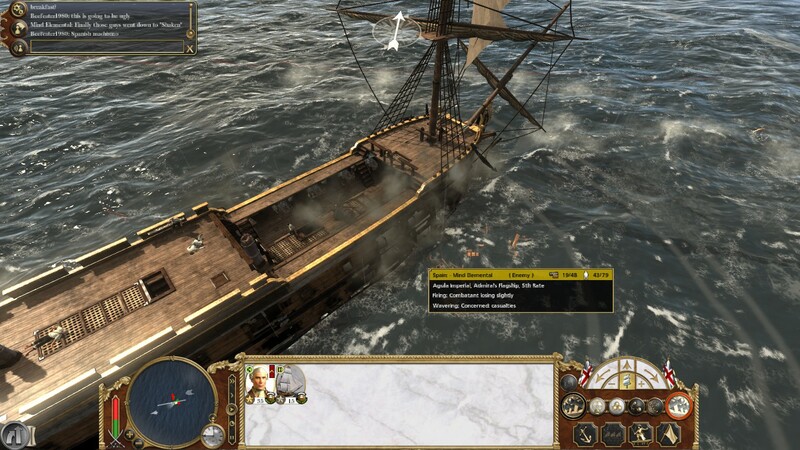 To be sure, the Spanish computer player ensures that the naval campaign is not a one-sided affair. The Royal Navy takes its fair share of losses in a series of largely auto-resolved skirmishes in the Caribbean and in the East Indies. But when the smoke clears, the Spanish navy has been driven from the East Indies, leaving British trade fleets free to move in. When the Spanish fleet finally shows up in force in the Caribbean, my luck looks like it’s run out. Against my fifth-rate frigate and sloop, the Spanish have brought a frigate and sloop of their own, plus a galleon that tremendously outguns anything else on the field. My first response is to panic. And then, once the battle starts, I breathe a sigh of relief: the Spanish ships are damaged and missing most of their guns. It’s still not a done deal – even in its weakened state, the galleon is able to blow away my sloop when it strays too close. Still, the frigate duel is as one-sided as I could have wished. I shoot away the Spanish frigate’s masts, destroy many of its remaining guns, leave its hull blackened and punctured. Yet the crew neither flees nor surrenders in the face of volley after volley of cannon fire. And, to add insult to injury, their morale remains high even as the ship rides lower and lower in the water. I am left wondering, over the in-game chat, what the Spanish sailors are eating for breakfast. It takes the outbreak of fire for the crew to abandon ship, by which time I am convinced that if they had been around 120 years earlier to man the Spanish Armada, history would have taken a very different course. Back in Europe, though, things don’t go quite as smoothly. When we left off, the French had been repelled at the gates of Amsterdam and John Churchill, the Duke of Marlborough, was leading a mid-sized force into what is today Belgium. The small Spanish garrison in Brussels falls quickly, and I turn the territory over to the Dutch. I feel well pleased with my raid! While my army doesn’t have the movement points to make it back to the sea on the same turn, I am able to withdraw my army so that it’s close by a friendly, smallish Dutch force. What could possibly go wrong? As it turns out, plenty. The French army – numerically superior, even after its defeat at the walls of Amsterdam – moves in to attack Marlborough. 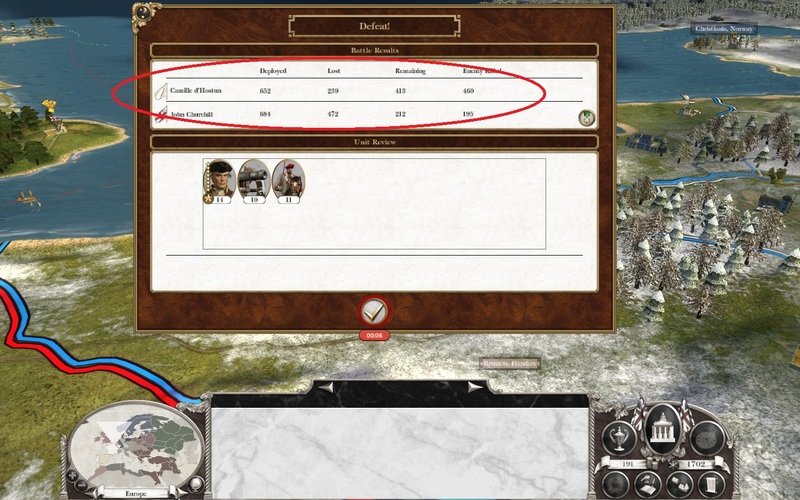 The Dutch computer player, instead of taking up a good defensive position, charges out into the open field, and I follow suit, fearing the piecemeal annihilation of the allied armies. My infantry-short army lacks the numbers to shoot it out with the French, and I botch the timing of a cavalry charge at the French flank. When the dust settles, the British army in Europe is reduced to Churchill, a single artillery battery, and a handful of horsemen who escaped the rout. In an eighteenth-century version of Dunkirk, they slink back across the channel, and with them goes any thought of a quick land victory in Europe for Great Britain. Disaster in the Low Countries (II): Le Roi, Jeeeenkins! The turn ends. 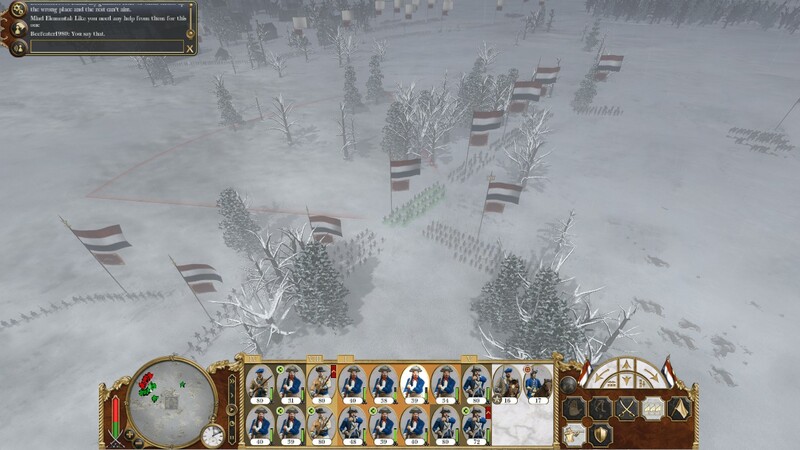 And the Dutch AI player abandons the shelter of its walls to attack the French. The resulting battle, trained and experienced French soldiers versus the Amsterdam mob on an open field, goes predictably. The best thing about the fight turns out to be a bout of unintentional comedy, when one Dutch regiment, retreating from the massacre, climbs the walls of its own fort to get back inside after the gates refuse to open. Unfortunately, at this point, we had to switch French players, as PC issues forced Peter Davies, our original France, to drop out of the game. Stay tuned for the next update!